Fed Governor Lael Brainard: Asset valuations and business leverage post elevated risks, and tax cuts and new spending could raise the risk of financial imbalances in the economy. Banks should assess the risks they face and how they could be affected by uncertainty; banks have begun factoring deregulation into their decisions. Lots of focus on rate risk might be overshadowing an arguably more significant problem: credit risk. Interest rates and the economy's overall financial stability are somewhat in flux. Banks must be prudent with what they can control. As banks savor the possibility of deregulation, many are anticipating a ramp up in new lending. While this optimism may feel good in the moment, it’s important to keep in mind a lesson from history: when legislators make decisions in highly regulated areas, unintended consequences often result. Consumer and business lending continues to enjoy favorable market conditions post-crisis, but uncertainty abounds in both the banking industry and the economy overall. Record low interest rates are on the rise, the federal deficit is soaring, the Fed is in the midst of a $4.5 trillion unwinding and the tax overhaul has dramatically shifted the landscape. In April, Fed governor Lael Brainard acknowledged recent economic gains but warned against rolling back regulatory safeguards. She noted that asset valuations and business leverage pose elevated risks, and tax cuts and new spending could raise the risk of financial imbalances in the economy. For banks, this is a moment when they may want to assess the risks they face and how uncertainty could affect them. While my view is that deregulation will likely not be as sweeping as many are projecting and post-crisis regulation is unlikely to recede to pre-financial crisis levels, some changes appear inevitable. A bill championed by Senate Banking Committee Chairman Mike Crapo, for example, would raise the threshold for stricter oversight by the Fed to banks with $250 billion in assets, up from $50 billion. Just 13 banks – down from 38 – would face more stringent capital requirements, mandatory annual “stress tests” and other criteria. Are we Focused on the Right Risks? Whatever the final outcome that awaits from a regulatory perspective, banks are already factoring deregulation into their decisions, which is helping drive heightened expectations for this additional lending. And while banks have been focused on rate risk, we are forced to wonder is that enough? Rate risk may be overshadowing a problem that is arguably more significant in a rising rate environment – the specter of credit risk. While the two are connected, credit risk may be getting less attention than it deserves. 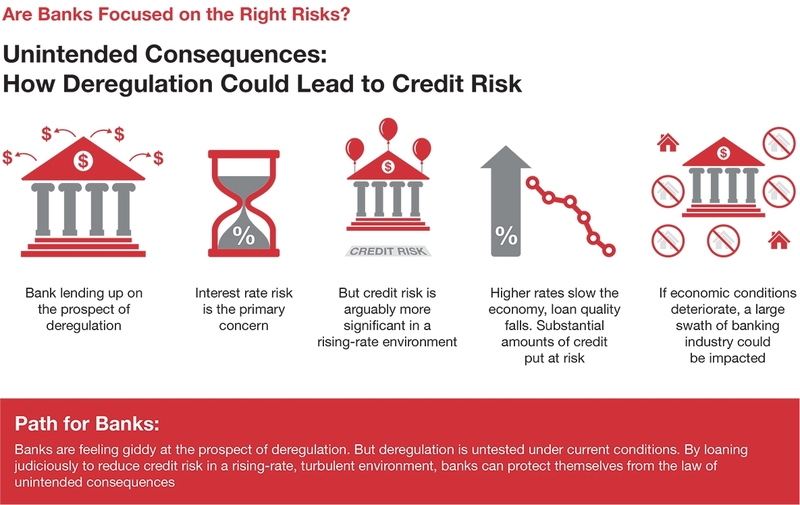 How could credit risk emerge as a major issue for banks and other financial institutions? If higher rates slow down economic conditions, causing a shift or deterioration in terms of credit worthiness among borrowers, more-available loans and high-risk borrowing could put substantial amounts of credit at risk. The effect will be magnified across the economy because of the concentration in the banking industry. A downturn in credit and a selloff in the equity markets will obviously affect individual banks differently, depending on the types of loans they’ve made, such as floating or fixed, and their borrower profiles. Early indications of credit risk will be small hiccups of defaults and losses, particularly at alternative lenders and other non-regulated entities, but a deterioration in credit among the larger banks in the midst of capital standard changes for these institutions could result in a less than optimal scenario. The equities market could be similarly affected. Bank stocks have soared on the promise of deregulation, but underlying valuations may be problematic. Over time, if conditions deteriorate, a large swath of the banking industry could be affected. For now, the economy is still on sound footing and risk seems contained. But with interest rates and the economy’s overall financial stability somewhat in flux, it’s important that banks are prudent with what they can control. In the short-term, banks may want to make the most of the growing economy and the prospects of deregulation. Corporations are willing to borrow and spend in the current low-rate environment, and banks are likely to have more capital to provide to them. Expected rate hikes should be a boon to banks’ profitability. However, banks that look to take advantage of current conditions and the prospect of deregulation should keep in mind that the ultimate outcome may be different than expected. The ‘law’ of unintended consequences, particularly as lawmakers look to deregulate what is now a highly regulated arena, might well bring a premature end to the optimism they are feeling. After all, the proposed deregulation hasn’t been tested under current conditions. When it comes to banking in today’s complex and volatile environment, optimism is understandable but prudence is a better strategy.